An easy, quick BBQ sauce that will leave you wanting more! To make sauce, combine all ingredients in pot. Bring to boil and simmer for 10 minutes or until sauce thickens. 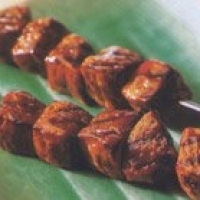 Thread beef on to skewers and brush with barbecue sauce. Grill on high heat, lid down, for about 5 to 6 minutes per side for a total of 10 to 12 minutes or until still pink in center. I love cooking with beer. Simple and it looks delicious ! My boys will love these Chef!! Thanks for sharing!! My Bf would definitely go for this! Thanks.